Under the hood, a powerful engine keeps things running nicely. The truck has best-in-class payload at 1,600 pounds as well as best-in-class towing at 7,650 pounds. 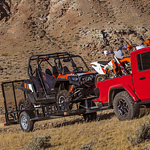 Other features that make it easier to load things up is a three-position tailgate and an available roll-up tonneau cover. If you're often relying on electrical power, consider putting in a 115-volt power outlet in the bed. The ride can be customized to your liking. If you want a peaceful ride, link the entertainment system with your phone to play your favorite songs. For a more exciting experience, take off the top, roll down the windshields, and pop off the doors to get the air flowing.